City planners often get very little public recognition for the work they do, and can sometimes take the heat on a project if it doesn’t prove politically popular. In the case of San Francisco’s revolutionary Pavement to Parks program, the early resistance to reclaiming public space from cars to create convivial spaces for people has gradually subsided and parklets are now in heavy demand. 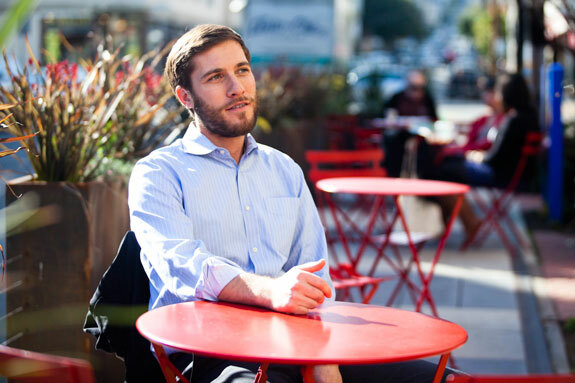 None of it would have been possible without the hard work and determination of Andres Power, an urban designer for the San Francisco Planning Department. 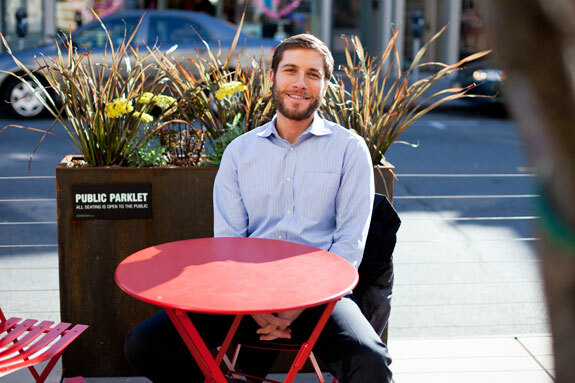 As the manager of the P2P program, Power has spent tireless hours managing the city’s initial plaza and parklet projects and moving them through the vast city bureaucracy. He deals regularly with merchants, neighbors and community groups. He’s worn a hardhat on many a Saturday and is the guy who gets called at midnight if something goes wrong. 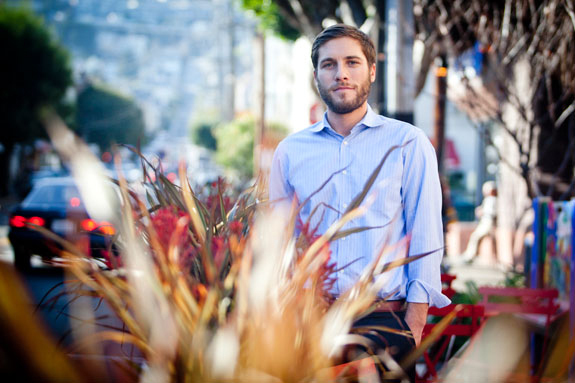 Power’s unwavering dedication, even in the face of fierce opposition, has made him one of the unsung heroes of San Francisco’s livable streets movement. Along with some of his colleagues at the Planning Department, Power is working from within to change the dysfunctional and old-school culture of city government with an eye to then transform our streets. The Pavement to Parks program is now catching the attention of cities all over the U.S. Last week, San Francisco issued a new request for parklet proposals, which means they’ll be spreading to even more neighborhoods. Power was born in San Francisco and grew up in the East Bay city of Albany. I sat down with him recently to find out more about his interest in urban planning, and his involvement in the Pavement to Parks program. Bryan Goebel: What sparked your interest in city planning? Andres Power: I’ve always loved cities. Being in a place that’s dynamic and changing and exciting has always been something that has intrigued me. I’ve tried to think back and to figure out what my motivators were and I think I just landed in the right place, to be honest. I had some great professors in undergrad at Brown University that really were forward and progressive thinking and inspired me. Then, after undergraduate, I went and worked in New York at the Department of Housing and Preservation doing economic development for the city and it was just an amazing place to be. It was so crazy and frantic, such a huge and complicated bureaucracy, but still, individual people could make amazing changes. BG: So this was in your early 20s? You must have graduated from college early then? AP: I graduated from Brown when I was 20. I was young for my age because I skipped a grade early on. So yes, I graduated early and worked for New York for, I guess, three and a half years. It was a really fun place to be, and I moved my way up through the system there and I was actually working in the Section Eight program. It was tangential to my interest but it was a fascinating work with a lot of smart people and it just really cemented my love for cities. It was so satisfying knowing that as a bureaucrat, I could make positive change for people. BG: Yeah, and I imagine living in New York deepened and inspired your interest in urban planning. AP: Absolutely. There’s no question about it. At that time it was right after 911, so it was early 2002. The offices were four blocks from the World Trade Center so it was an interesting place to be, for sure, and the focus was really on emergency management type stuff, at first, and then things calmed down, and it was much more about starting to think about the future, and looking at the long-terms goals of the city. The notion of working for an entity that is thinking about what the future’s going to be in 20-25 years, and doing things in the short-term, to move us in that direction is incredibly satisfying. That’s what I do here now. It’s really about seeing what we want this city to look like, how we want it to function, how we want it to be for the next generation and working on the immediate steps to make improvements that move us in that direction. BG: So you spent three and a half years in New York City, and then went to grad school at MIT for two years? AP: Two years, yes. MIT was an interesting place for sure. The urban studies program was somewhat isolated from the rest of the university but was still a crazy place. The buildings were all connected underground by these tunnels and there’d gatherings sometimes on the weekend in the tunnels where people would all dress up in Star Trek attire. So, a lot of the stereotypes that you would think of for MIT, definitely a lot of that happened there. It’s also a great place to be. People were really smart, really motivated and undoubtedly the program really cemented the notion that this is really what it was that intrigued me. BG: So after MIT what happened? AP: Getting a job anywhere in government takes a lot of time so the beginning of my last semester, in January or so, there was a posting for jobs here in San Francisco. I applied and actually got called back sooner than I’d anticipated, came out here over spring break, had an interview, had a second interview and was hired as an entry level urban designer for the San Francisco Planning Department. BG: What exactly were you hired to do? AP: The first thing I did was to come up with a streetscape plan for San Jose Avenue. It was a good first stab at doing this type of work and getting to learn the dynamics and the politics here. I remember going out with then Supervisor Gerardo Sandoval in his personal car. He took me down and showed me what he thought needed improvement. It was great, understanding the craziness and how the system in the city works, and how the public realm is managed by so many different agencies and entities. It was an eye-opening experience. Then from there I started doing a lot of graphics type stuff and early plan development for the Rincon Hill streetscape plan and the Better Streets Plan. BG: So how did Pavements to Parks get started? It all pretty much began with the 17th Street plaza, right? AP: Yes. I’d been working with Adam Varat on content development for the Better Streets Plan for a couple of years at that point, and in that plan there was a lot of discussion about temporary uses of the right of way. What that meant wasn’t fully fleshed out but the idea was to be playful with the public realm and to think about uses that perhaps changed over time. Being creative in how we use a parking lane, for example, was particularly exciting to me. Then, New York City Transportation Commissioner Janette Sadik-Kahn came and met with the different department directors and basically challenged the city to do something. She came and presented the work that she was doing to DPW Director Ed Reiskin, my director, John Rahim, and [SFMTA Chief] Nat Ford and the representatives of the Mayor’s Office and said, ‘This is what we’re doing in New York,’ which was a challenge to do something similar over here. So, in response to that challenge, all the different departments submitted a list of possible projects based on culling the archives of community plans and public efforts. So that project, the Castro 17th project, was one that had been advanced by a couple of agencies. With DPW and MTA we moved it forward. This was around the same time that the Upper Market Streetscape Plan was being worked on and it talked a lot about making improvements to that intersection. So, it just sort of all came together, and [City Design Group Manager] David Alumbaugh felt very strongly that we should start off with something bold, making the subsequent projects easier by comparison. It was a smart move to make. As small as it is, the Plaza location was as complicated as one can be, with the streetcar going right through and cars coming from just about every direction. But we knew that the users were there, and that the community was generally on board with it. At the same time Public Architecture came to the city and was offering its services to help with a public space project. Change is always hard. Beyond the actual projects that the Pavement to Parks program has installed, I think in my mind the most beneficial change is really pushing the city family to be okay with experimentation. At Castro, how a trial plaza could come together was incredibly challenging for the bureaucracy to wrap its collective head around. So the proposal languished. Getting approvals was incredibly difficult. But finally, with some colleagues we thought, ‘we’re just going to get this done, this is ridiculous,’ and we got it done. Once the project was installed some department heads came together with the Mayor’s Office to talk about what we learned and what the next steps were. Basically, what came out of that meeting was that we needed someone who would be empowered to just make things happen and someone who ultimately would be responsible for delivering the projects. So, they put me in charge and that’s how the program came to be. BG: What do you see as some of your biggest challenges now? AP: Amongst the city family, I think generally speaking that there is alignment with what it is that we’re doing, but not everyone necessarily agrees 100 percent, or is as gung-ho about this work as I am. It’s incredibly difficult to get people to just say, ‘this is how we’re going to make it happen.’ The culture has been changing and it’s gotten much better, at least in a relative sense over the last number of years, but the culture’s always been, ‘no, you can’t do it and this is why.’ It’s never been, ‘This is what you want to do, let’s figure out how we’re going to make it happen.’ And as for design, it’s always been the common denominator that gets implemented. Everyone has to weigh in. Muni weighs in, the traffic engineer weighs in, the utilities weight in, the street sweeper weighs in. Then once you’ve resolved all of their individual concerns, you have your end product. That’s how things have been done historically, but at the end of the day that end product doesn’t necessarily advance the city’s collective goals. The most challenging piece is getting the projects through a system that is not geared to making these kinds of things happen in an easy way. BG: What about the occasional opposition that arises from merchants, or neighbors, like what happened in Noe Valley? AP: Not every project is going to work and I think it’s great, ultimately, that people speak up for what they believe. I may not necessarily agree with that position, and I may know their arguments are technically incorrect, but at the same time, I think it’s perfectly legitimate for people to not want something and I think that’s just part of the way things are in a heterogeneous community. Generally speaking, most people want urban public spaces, most people want open space, most people want amenities, most people want bicycle infrastructure, most people want storm water improvements. So, it’s not convincing people of the merits of that per se. A lot of it has to do with disagreements between one neighbor and another so these kinds of projects can become the polarizing element for that. I have no problem with this reality, and it’s why cities ultimately are fun places to work in. It’s not like working in the suburbs where you have a much more homogenous perspective on things. BG: I was walking on Dolores Street recently and had an encounter with a woman who was walking her dog and was just furious the city had removed a parking space in front of her house to install a crosswalk. There’s a ‘war on drivers,’ she exclaimed. In your role as a planner, and this is a difficult question, but how do we win the hearts and minds of people like that who don’t feel like they want to give up any space for cars? AP: It’s not an easy answer. If we knew the answer to that, then we’d be golden. I think there’s a couple of things at play. In large part our work is about education and we’re not always good at that. I’ll be the first to admit that I’m not the best. I think generally the city family’s not very good at it, but really what we ought to be doing, as people who are paid to be thinking about the future, is tailoring our messaging in an understandable way and to be able to explain why it is we’re doing the things that we’re doing. So, I think a lot of it is education. Some people may just fundamentally disagree with your position and that’s okay. But many people, when you have an informed and rational discussion about the merits of an effort, can ultimately become your best supporters. But specifically when trade offs involve a car, I think unfortunately people can become very passionate about it. BG: Emotions can get in the way. AP: It’s very emotional, yes, and so to a certain extent you have to do your very best to educate, and to be that facilitator and explain what it is that you’re doing, and why you’re doing it, and what the benefits are for each person because ultimately it’s not just about taking away something from one person, and giving it to another. It’s about advancing our collective benefit. I think any type of change can be difficult for people, but at the same time, I do believe that delivering good projects and being able to show, for example, the lady with her dog, that benefit to her as she’s trying to cross the street. There really is an immediate benefit to her. She’s probably much less likely to get hit by a speeding car. Her dog is less likely to get run over because of that improvement that was made. So, it wasn’t just about taking a parking space away, it was about making her condition better. I think the city is not the best at making this understood, although we’re constantly working to improve our communication. BG: Where do you see the Pavements to Parks program going? AP: That’s a good question. 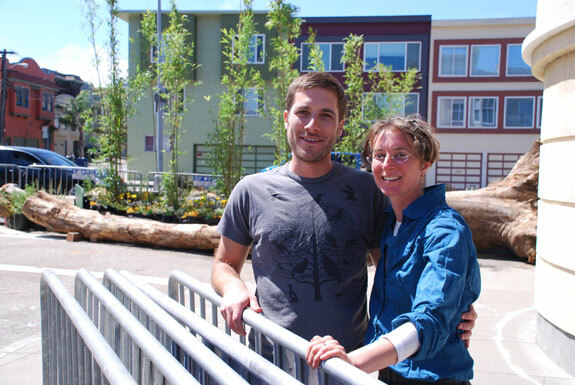 The Pavements to Parks program has been really focused as of late on getting the parklets up and running. I think we’ve done that. I think we’ve created a model that is sustainable for the long term. We’ve done a lot of work, with great help from the Department of Public Works, the MTA and the SF Great Streets Project, to come up with the mechanisms to evaluate these projects and facilitate them because at the end of the day we want to be encouraging this. We want the city structure to be set up in such a way that it’s incentivizing and not making it difficult to make public improvements. So, with that under our belt, to a certain extent the question now becomes, what’s next? Are there going to be more plazas? Are we going to be doing some other design typology perhaps that we haven’t even thought about yet? I think the answer to that ought to be yes. Aside from the physical projects that Pavement to Parks has produced, which I think are great things, one of the amazing contributions it’s provided is showing that experimentation is a good thing, and how it can produce good stuff. The vehicle of Pavement to Parks, this interagency cooperation, can apply to anything. Theoretically, it could apply to innovative treatments of a bike lane, or whatever it is we want to try. The structure of Pavement to Parks is such that the actual physical improvement can be anything, but the process to get it on the ground is really about what Pavements to Parks provides, and it’s an expedited process. I think it’s a great example of what happens when people come together saying, ‘We want to get this done, how are we going to make it happen,’ as opposed to figuring out a way why you can’t. I think the streets of our city ought to be designed for the kind of use that provides the most benefit to the most people, both at the local level, and ultimately on a global level because what is sustainable in the long term is a city that encourages and gives priority to people who want to walk and who want to move around in a way that doesn’t produce an externality on somebody else. Unfortunately, for the last 50 years, it’s been the opposite. We have been prioritizing the mode of transport that provides the most externalities on people, and so I think a long-term vision for the city is one in which the fabric really is about the best common good. I think for me what that means is a place where driving is a last option. I think we’ve got a long way to go to get there, while, at the same time, I do feel like there will always be the need for a vehicle. I have to remember to say that because I do believe it. I think whether it’s a solar powered car or whatever it is, ultimately there is a need for transport of kids and goods but as a primary transportation mode, I think that there isn’t room for that in the city. 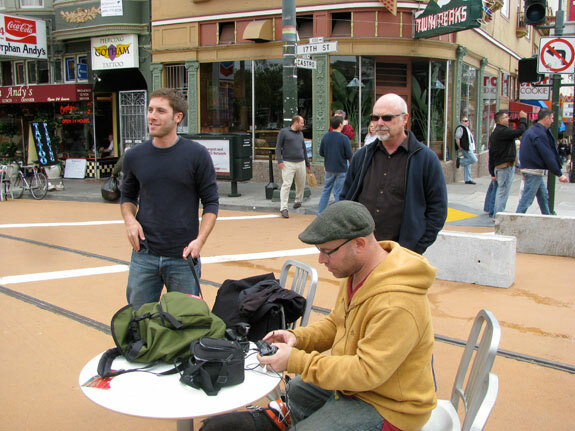 BG: What advice would you have for other cities looking to do parklets and plazas and repurpose space for people? AP: Start with the location, either for a plaza or a parklet, that you know will be successful. One that has a strong on the ground partner who is vested in helping ensure that the space is successful. This is absolutely key as the success of the first installation sets the groundwork for many more. Also, don’t expect to create a program first. Start with a great project that people will be excited about and the program will follow. Get authority from the very top – you’ll need it – so that you can push through the inevitable red tape. Also, have an answer to the inevitable questions that will come up. “Putting a parklet in will make the cross section of the street too narrow for a fire truck.” Remind the reviewer that a parklet is no wider than a parked car. If it’s okay that a car is parked there, why can’t people sit there too. Celebrate the first project. From there, the next installations become easier. Andres is the man. It’s too bad we didn’t succeed in Noe Valley because had we done so, he’d be getting international acclaim instead of local acclaim. The small parklets are being well used but that street plaza would have been wildly successful. However, Andres, who was very skilled to begin with assuredly learned a lot in the process. And now the parklets are going in fast and furious while New York City keeps preventing their “pop-up cafes” from being installed. Cheers to Andres! Congratulations Andre and thank you for all your work on behalf of improving our streets for pedestrians and bikes. @Michael Helquist and I met you at Parish Trust during the Divis Artwalk. Great to hear about all the good work you’re doing. Wait… this is in SF. How can ill-tempered New Yorkers tell Andre to “Go back where you came from, you commie pinko tree-hugger!” It doesn’t seem fair to the folks at the NY Post. three cheers for the pro photographs! “It’s about advancing our collective benefit.” That’s his best answer to the lady with the dog? Does the ‘collective benefit’ include a place for her to park her car? That’s all she wants to know. Maybe she got a ‘disability tag’ on her car and can’t hump those hills? What then? Maybe she just an ordinary citizen who has an ordinary desire to have a car to get around. Would you just dismiss her? You have got to find someone who can talk to drivers in their own language and with their interests in mind. Too bad Steve McQueen is still dead. How about a parklet right at the southwest corner of Turk and Masonic, just at the last parking spot atop the hill. We need to do something constructive to remind motorists to look for pedestrians and bicyclists as they approach that hill right where visibility drops for a critical second. I am of the opinion that it’s not just speed thats the issue on Masonic and Turk. We need to remind/prepare West-bound motorists who yield across traffic turning southbound onto Masonic to look for people BEFORE they turn left. So often, motorists gun it to beat oncoming traffic, and suddenly, car and pedestrian meet wheel to toe in the crosswalk. I’ve had so many near-misses from just that scenario. There’s a public hearing on May 13th at 10am for the Masonic Avenue Redesign. In the meantime, I wonder if we can make a parklet to remind people to slow down and share the road. We don’t even have a crosswalk countdown at our intersection yet, so as a resident of this dangerous intersection I’m looking for a way to act now. I can’t believe how many times municipalities ignore this reality, including DC. Too many times a project is supposed to be piloted in a community for “social equity” reasons, but the community capital and support isn’t there and the project fails or never really gets off the ground or is interminably delayed. E.g., DC’s streetcar program started with a demonstration line in Ward 8 (Anacostia), which is still delayed due to opposition.